Stool with legs of solid beech wood and original skateboard deck. The Nollie Flip Stool is strong and comfortable. This stool ships fully assembled and ready to sit. 2.- to complete your morning coffee on skateboard coffee table. 3.- Bed tray. No more overheating of the computer. You can now work in bed. 4.- Somewhere to sit to tie your skateboard shoes. 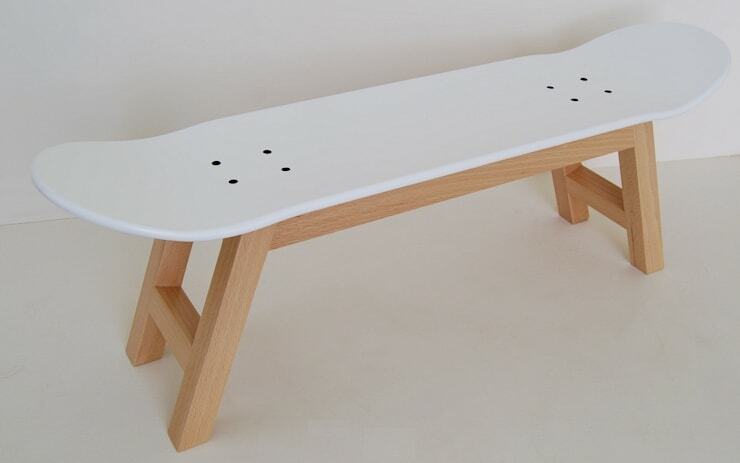 5.- Rest your feet up after a long skateboarding session on this stylish addition to your home. 6.- To grab something off a shelf. 7.- To sit in meeting with friends. 8.- For sweeping away mess and storing skateboard magazines, books or stuff. and especially and most importantly… .. to personalize your home with decorative accessories that reflect your lifestyle.